Everything went wrong. Ophelia was gone. After years of his life had been sent searching for his purpose, and he had found love in one strange woman. She was a warrior, capable of standing at his side and possessed intelligence which surpassed his own. Her heart had been damaged, but he held it gently, bringing her back to life. So strong was his love that he was jealous of the very sun for blessing her, and he had planned to live every day in her presence. That had been torn away. Tears streamed down his dark cheeks as he saw the bleakness of his future. He wanted out of this cursed land so that he could go back home to the snowy north. His mother, dead. Village, burned. Ophelia, dead. How could he make his hooves go on? How could he force himself to make a single step more? The stallion heaved a great breath and wandered toward the sea - hoping that it would take him asunder. The ground froze beneath his hooves. That was when he saw his daughter. Ellie raced up the beach to meet him, her own eyes puffy with emotions. His jaw clenched, wanting to appear strong but not having any heart left to put up a front to lie. "Come, Ellie. There is nothing for us here. Not anymore," he whispered. He didn't know how long they had, but they would walk together along the beach and leave the land whose name he'd curse forevermore. Where iron meets flesh. we'll take it all"
When darkness falls, fate calls"
Ellie watched her mother fight and felt anger and sadness. How could her mother throw her body and mind so selfishly into a fight no one could win? How could she do that to them when she had her dad and kids waiting for her to leave? How could she? Tears burned in her eyes and darkness shadowed her heart, making her body cast strange mirages where she was standing. That was when she ran. Her mother's last stand, body stained with red... that was all she could take. The dam broke inside of her and she sobbed as she ran toward the dark figure on the beach, seeing that it was her father. He was crying too. Did they have a right to be? Eleanor stared at him for a long time, gazing in his broken eyes and knowing her own were just a mirror. Torleik finally spoke, ordering them to leave with a strength that she did not possess herself, and she was grateful. Her dragon cooed from between her horns, mourning the loss of Tinek who died by Ophelia's side. For the rest of her life, she would be motherless. There was no use in mourning such a selfish witch. Something bad was happening, but the boy didn't exactly know what. He had stayed close to his father for some time now, learning from the stallion while Ellie had wandered off. She had the heart of her mother. 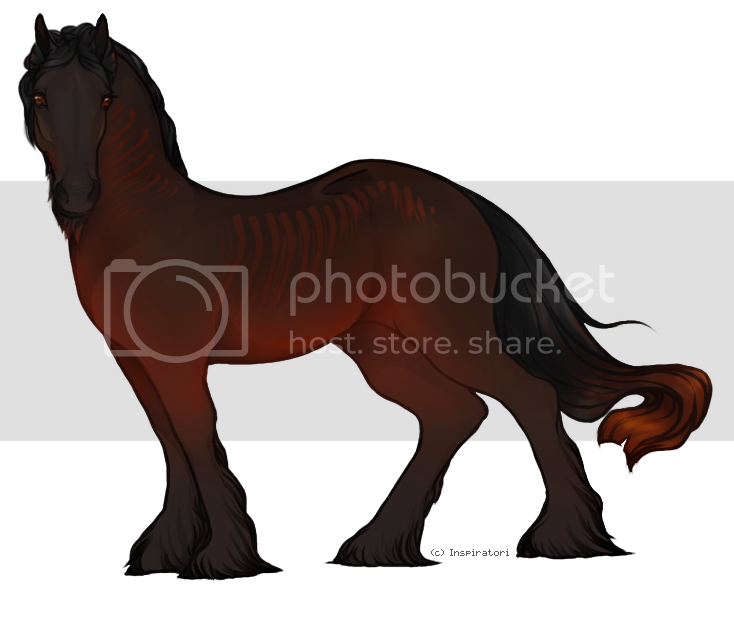 His red and black body ran across the sand toward half of his family, ears perked forward was he called after the two. "Father! Ells!" he bellowed, making the two of them pause in the distance. Finally, he slowed to a trot as he approached, and that's when he noticed the hollow and steady pain of their expressions. His brows furrowed over red eyes and glanced between the two of them in confusion. "What happened?" he asked, beginning to panic when neither of them could respond. He stood like that upon the stand, staring at his family. Wind whipped past his growing, black mane and tail, and he felt his chest heave as he caught his breath. A storm was growing in the south, and he stared, feeling the pit in his stomach get bigger every second neither of his family members responded. "Where's mom?" he asked finally. The truth was echoed in their silence, and he felt tears begin to roll down his face. He had no words left.